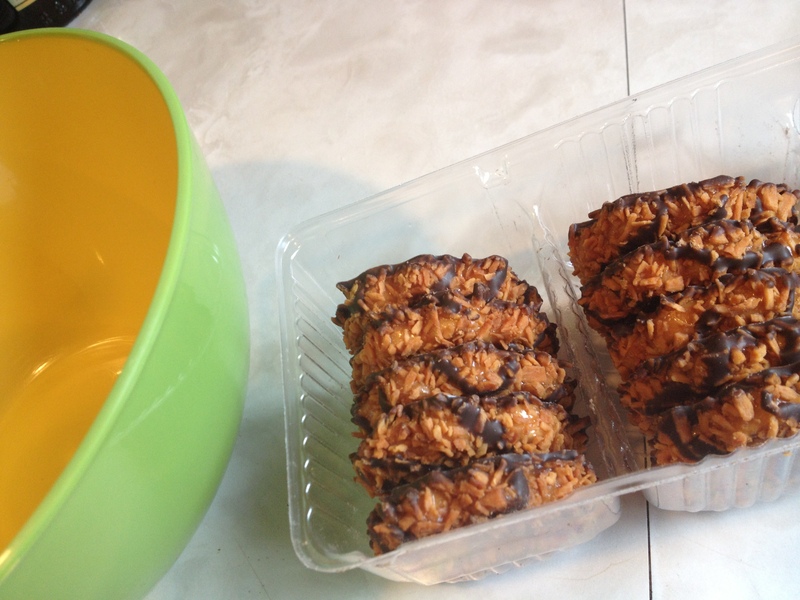 There are a lot of cookies in this world. 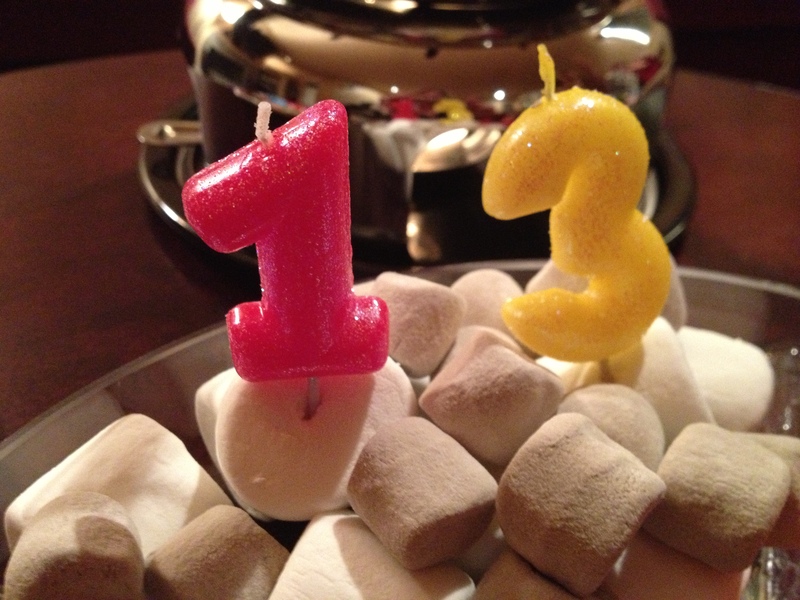 BUT there is one type you can only get once a year! 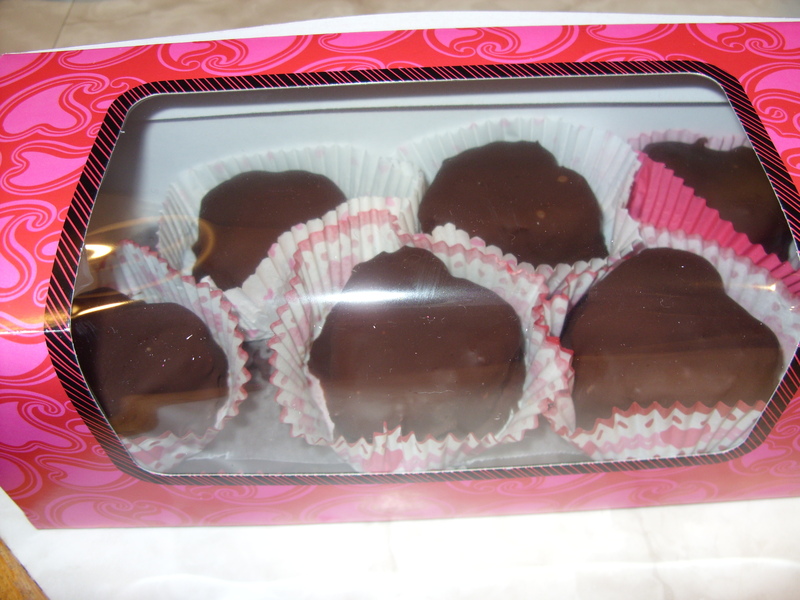 We wait, and wait, and when they arrive we buy them from our co-workers’ kids, our neighbors kids, from our own nieces, daughters and granddaughters, in front of the grocery store – anywhere and everywhere we can get them! 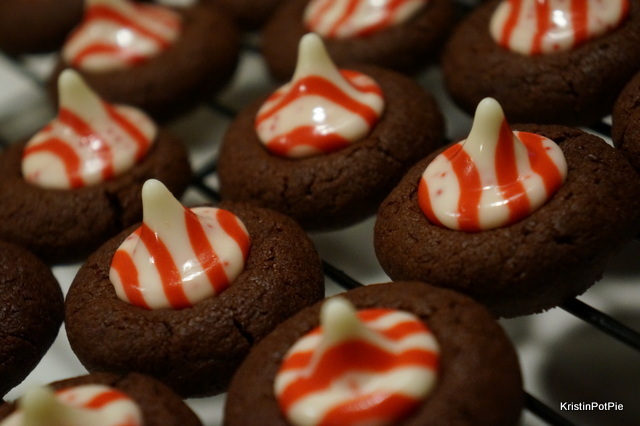 – many of us stockpiling them in pantries and freezers for the long “non-cookie” season ahead. 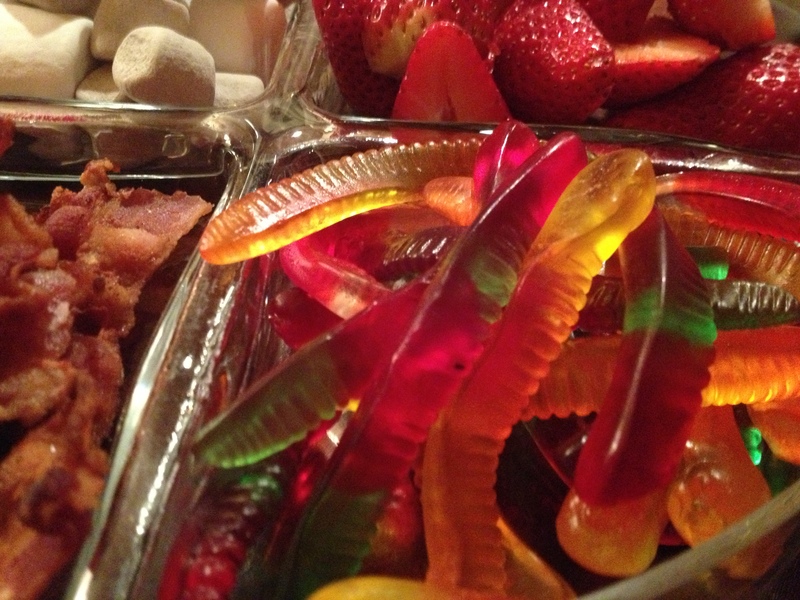 But what to do with that overabundance of yumminess? Why, think “out of the box”, of course! 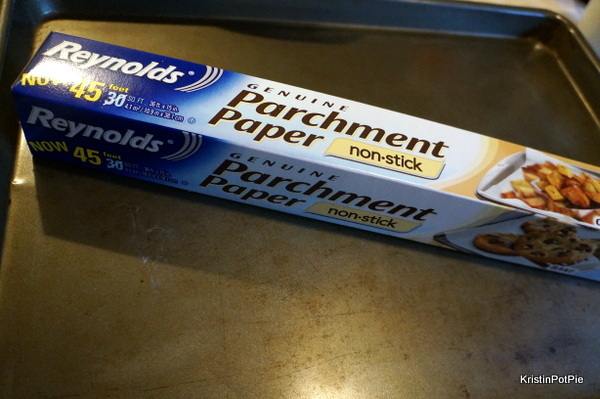 We know they are terrific right from the package. 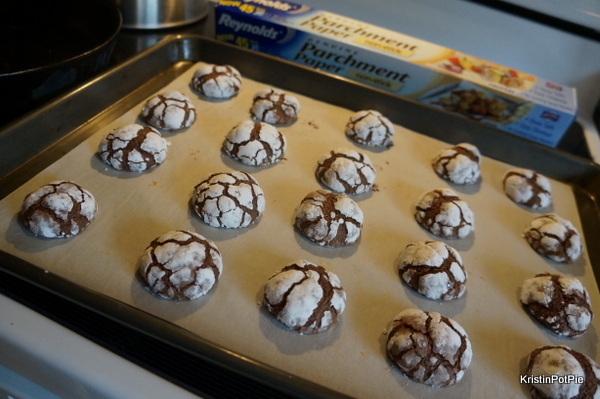 But The Girl Scouts of Western Washington hope to show you just how versatile these cookies are by once again hosting their cookie recipe contest. And they have invited local bloggers to submit their original creations. 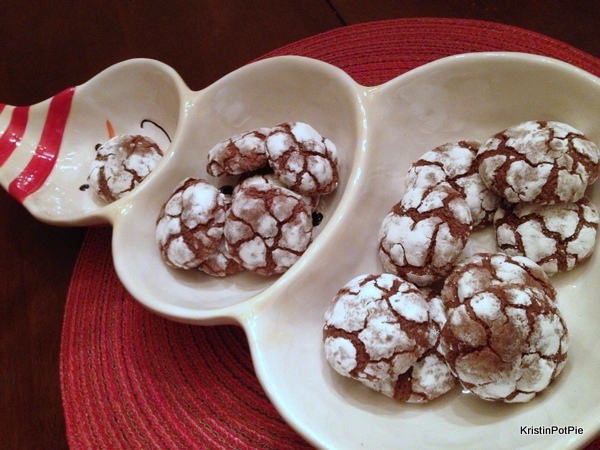 Frankly, I can’t think of anything more fun than playing around with cookies in my kitchen! Last year I went savory and made these delicious chicken fingers with lemon-flavored Savannah Smiles. 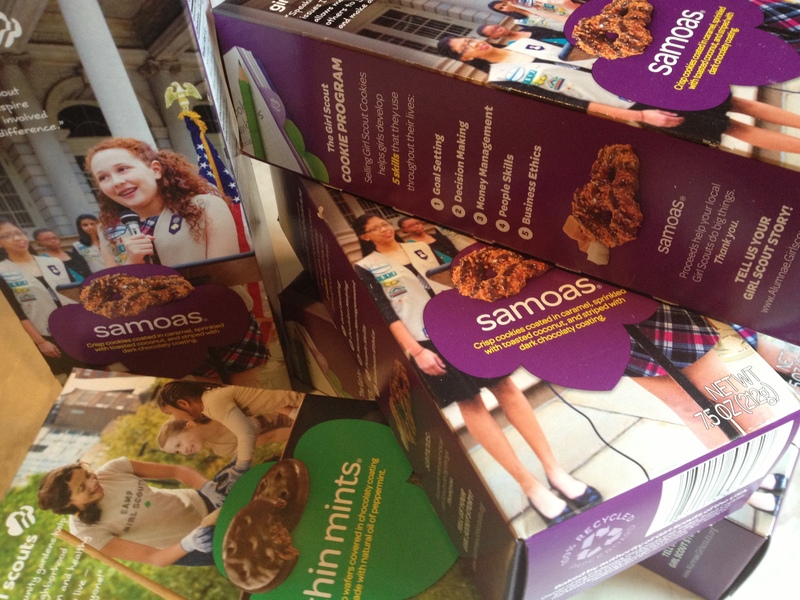 But my favorite GS cookie of all time has always been the Somoas. So this year I chose them to work with, and decided to go sweet. And sweet it is! 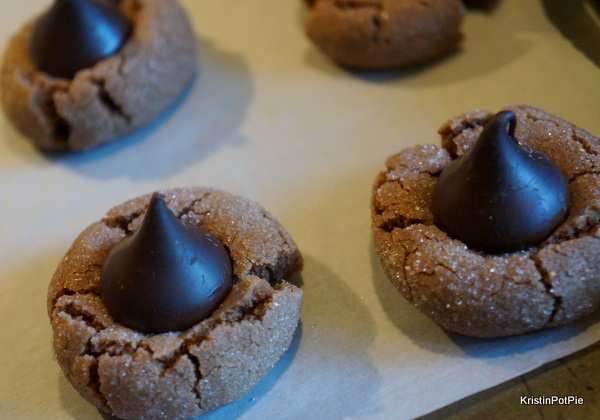 Who says you can’t have cookies for breakfast? 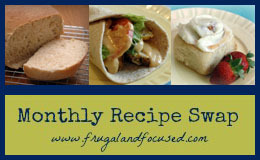 Cut up loaf of bread into rough cubes of various sizes. 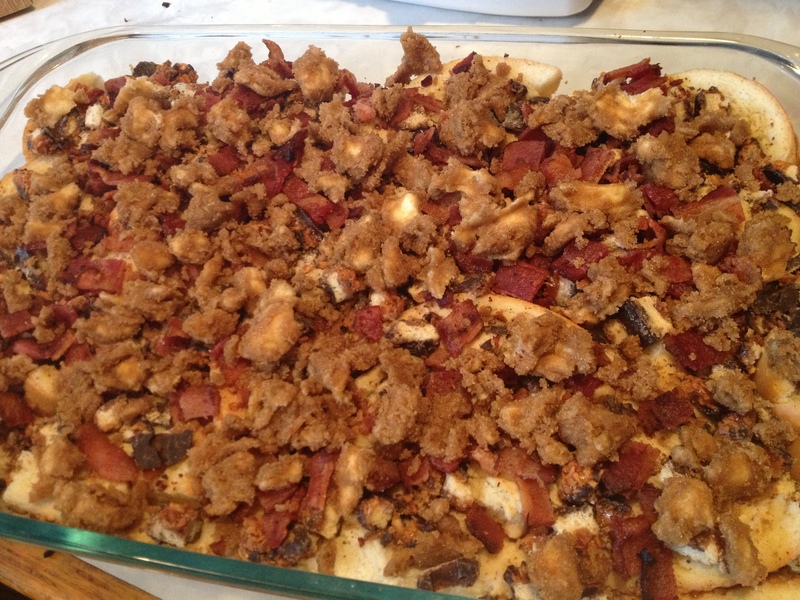 Spray 9″ x 13″ baking pan with non-stick spray and layer bread cubes into it, filling in as much space as possible. In a bowl mix eggs, milk, cream, salt, cinnamon and vanilla together. Pour egg mixture over bread and cover pan with foil. Refrigerate overnight so that the bread can soak up the moisture. 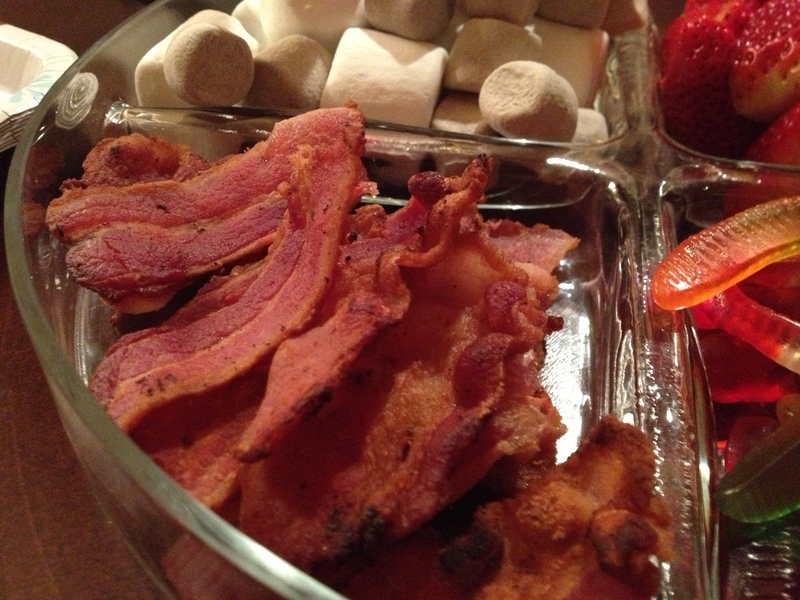 In the morning cook bacon to a crispy texture and chop it into small pieces. 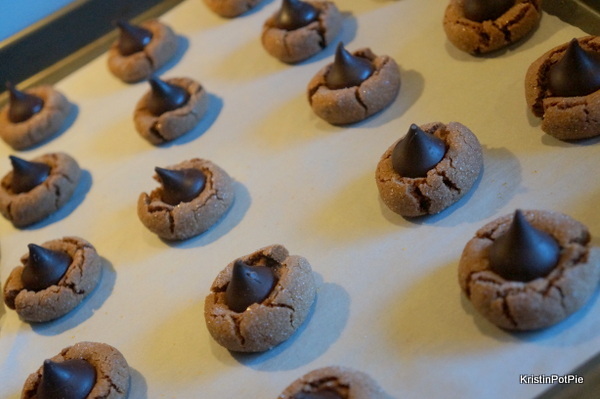 Chop cookies into small pieces. 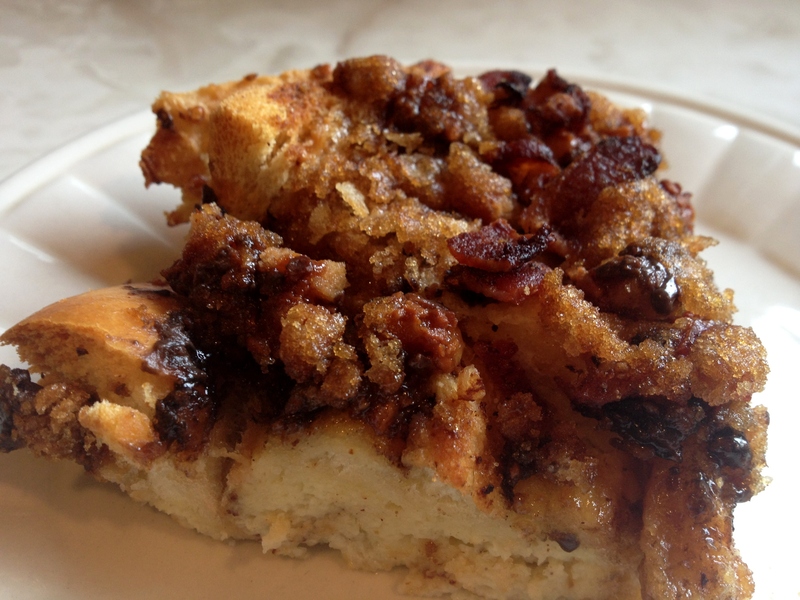 In a small bowl, cut butter into the brown sugar to make a crumble. 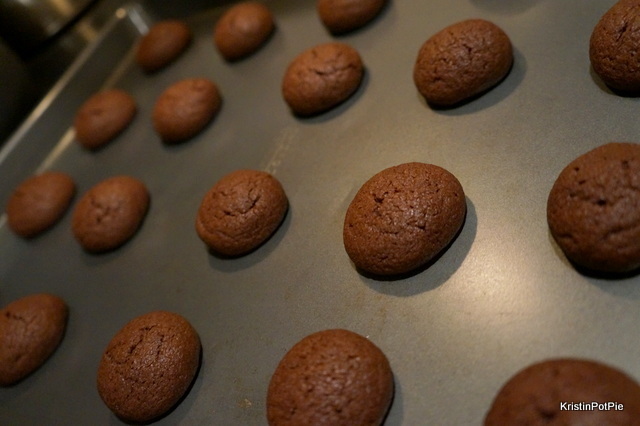 Bake at 375 degrees for 40 – 45 minutes. 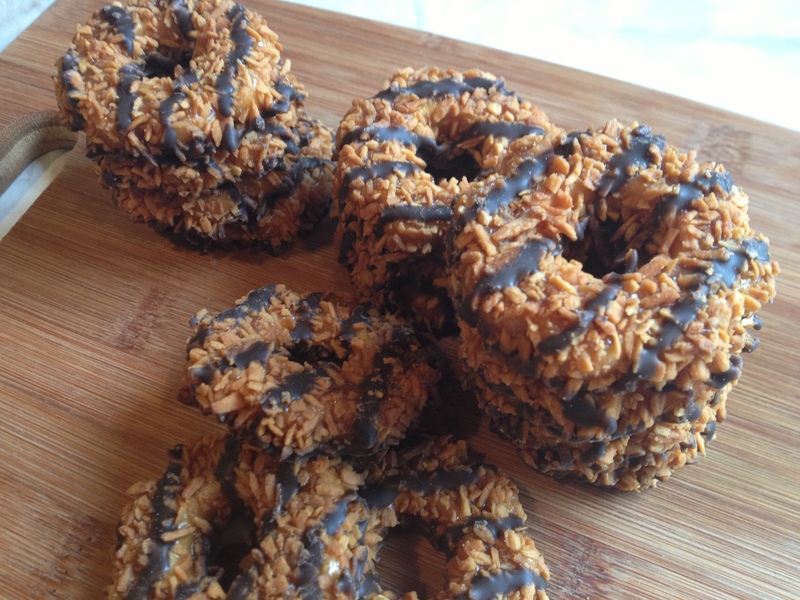 Whether you’re craving Thin Mints, dreaming about Samoas, or want to get your hands on some Savannah Smiles, your wait is almost over. Mark your calendars! 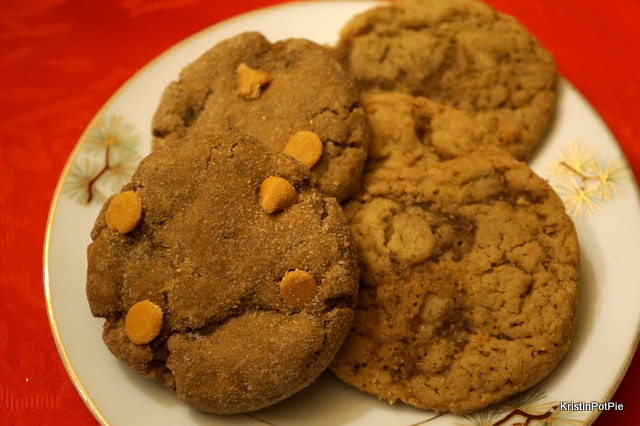 The cookie sale to the public is happening March 1-17! 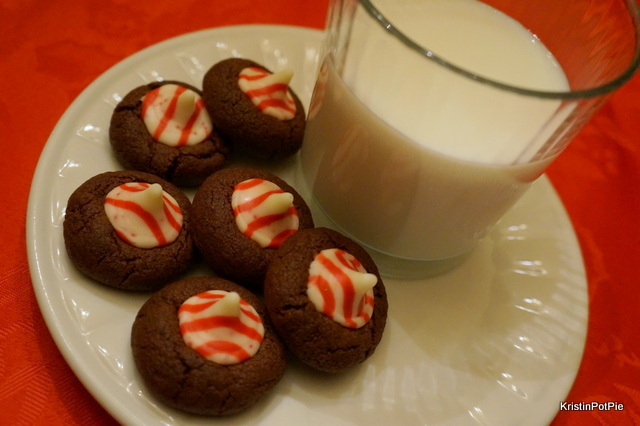 There is an awesome cookie locator, as well as an app, that tells you exactly where girls are selling cookies in your neighborhood! Very good to keep handy! 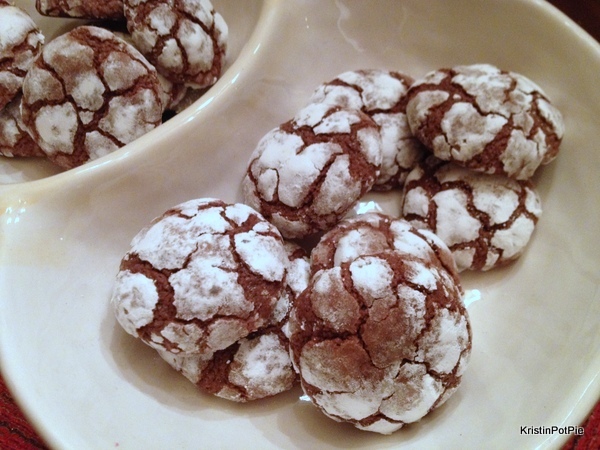 What is your favorite GS cookie? How do you like to eat them? Do you cook with them or just enjoy them as is? I have a confession to make. Shhhh! Don’t tell my husband! I may have been a bit sloppy and left some clues to my infidelity. 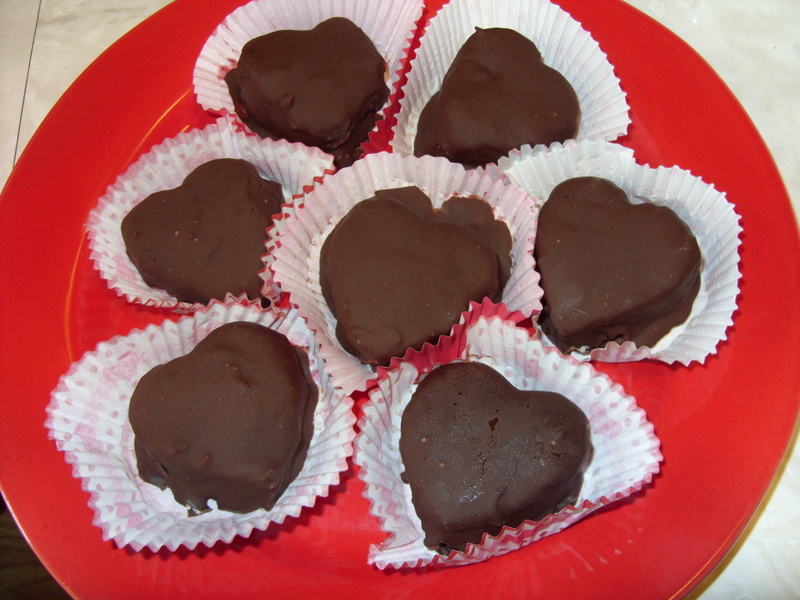 My latest post was about chocolate. As was my very first post here – still a good one! 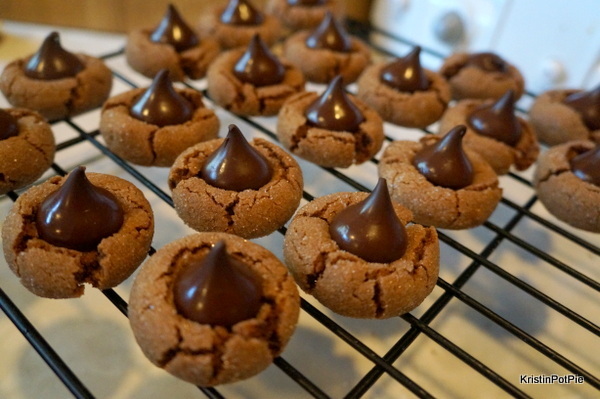 In fact, if there is any doubt in your mind as to just how strong my love is, a simple search for the word “chocolate” on “KristinPotPie” shows that, over the last (almost) three years of writing this blog (can you believe it’s been almost three years?! ), I have written about it almost to the point of obsession. But other times? Oh! It is ecstasy! Recently, our tryst took a very profound and meaningful turn – I didn’t think it was possible to fall anymore than I already had, but then I was introduced to the Deathcake Royale at Cupcake Royale. 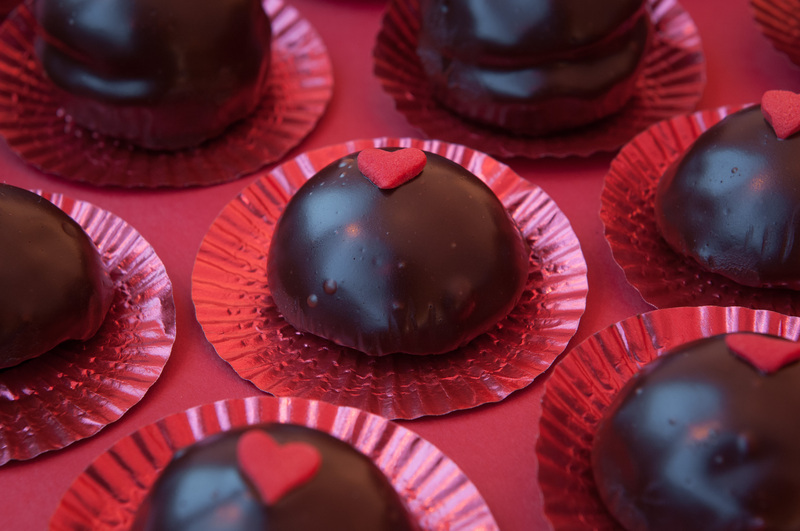 These little chocolate bombs ignite the passion like nothing else! 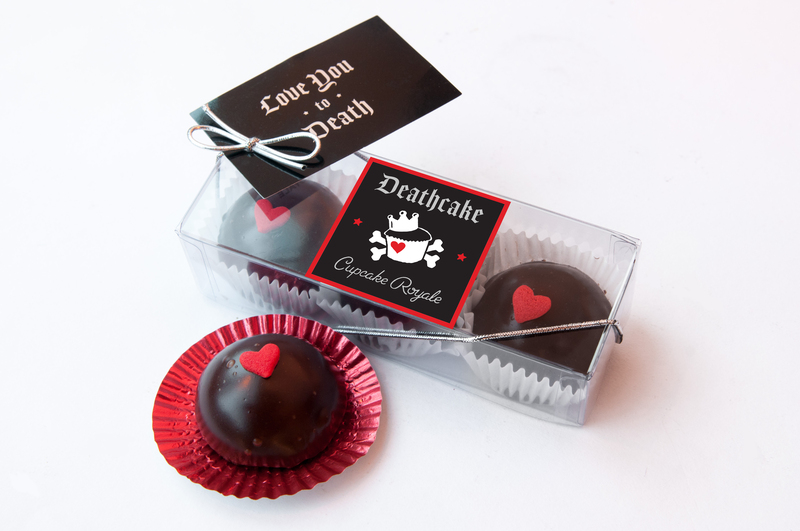 The Deathcake Royale is only available during Valentine’s season – starting tomorrow, Friday, January 18th through February 14, 2013 at Cupcake Royale cafes and online. So get them while they are here! And you can share the love this weekend with this special launch Buy One, Give One deal. 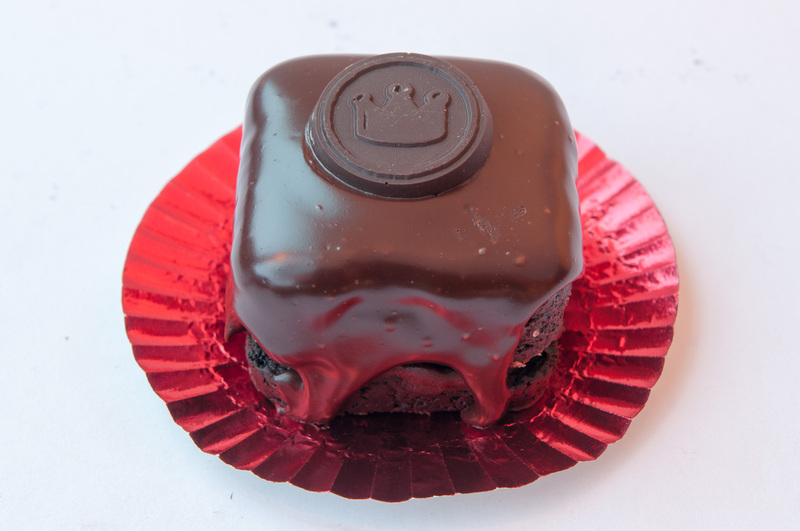 What: Deathcake Royale, comprised of locally made Theo Chocolate decadence fused with Stumptown Espresso ganache, and a pinch of fleur de sel. Cupcake Royale is making it easy as cake to SHARE LOVE and practice Random Acts of Cupcakes for anyone in your life that makes everything a little better. Visit a Cupcake Royale over Martin Luther King weekend, January 18 through January 21, purchase a Deathcake Royale on its debut weekend, and Cupcake Royale will give you a Cupcake-Gram to share (one per person, per visit). 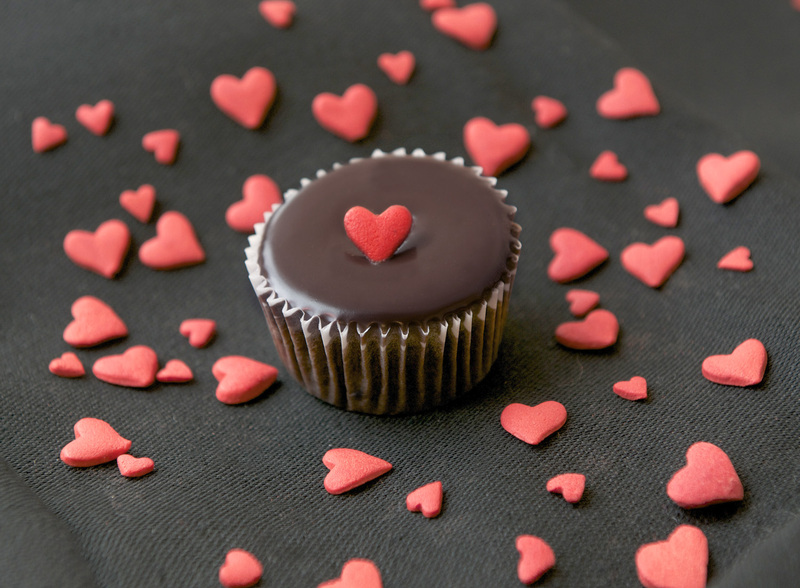 Essentially a Cupcake-Gram is a way to SHARE love and express gratitude with a short note. These are redeemable for a Cupcake or Deathcake Royale through February 10, 2013. 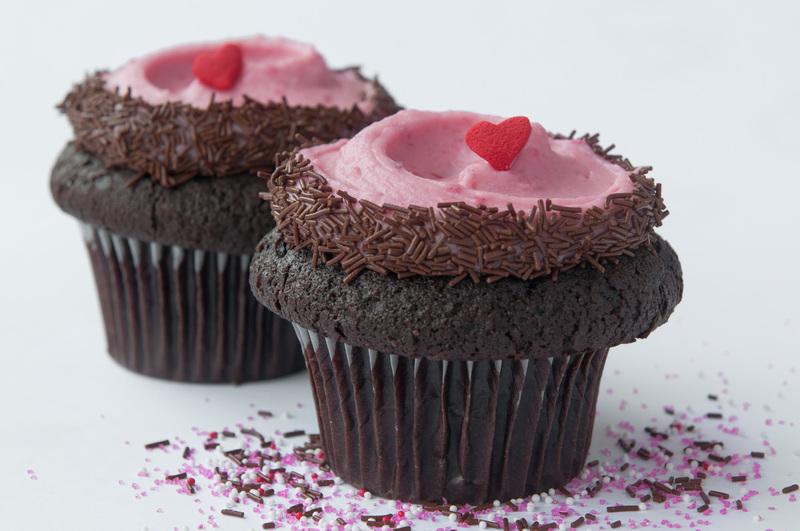 When: Starting Friday, January 18, 2013 through Monday, January 21, 2013- Buy a Deathcake Royale and get a Cupcake-Gram to SHARE LOVE with others. 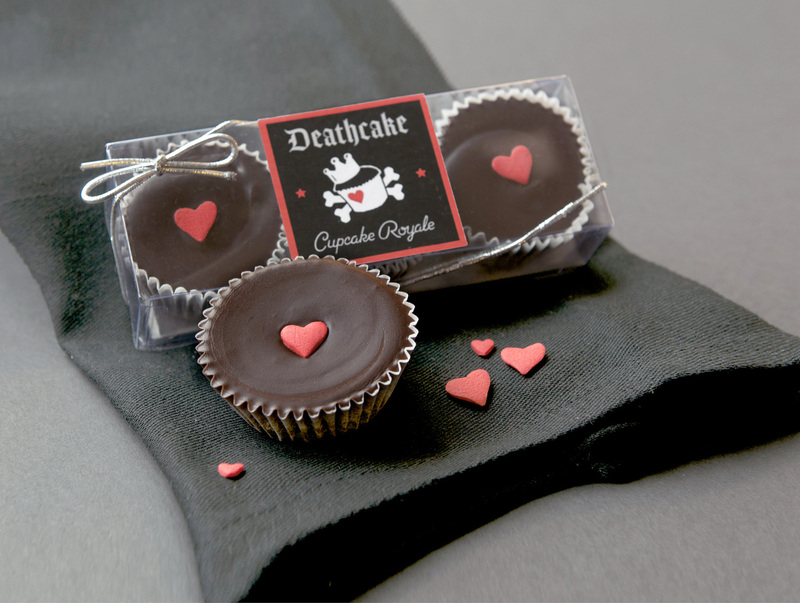 Look for samples of Deathcake Royale over the weekend too! Including Deathcake Royale Ice Cream and Deathcake Mochas. 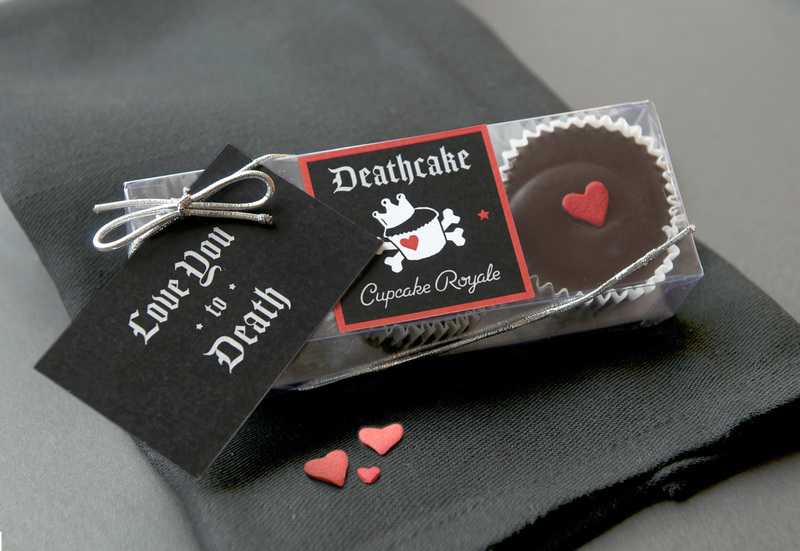 I say – if I had to die for love, let it be at the hands of the Deathcake! Photos used courtesy of Cupcake Royale. 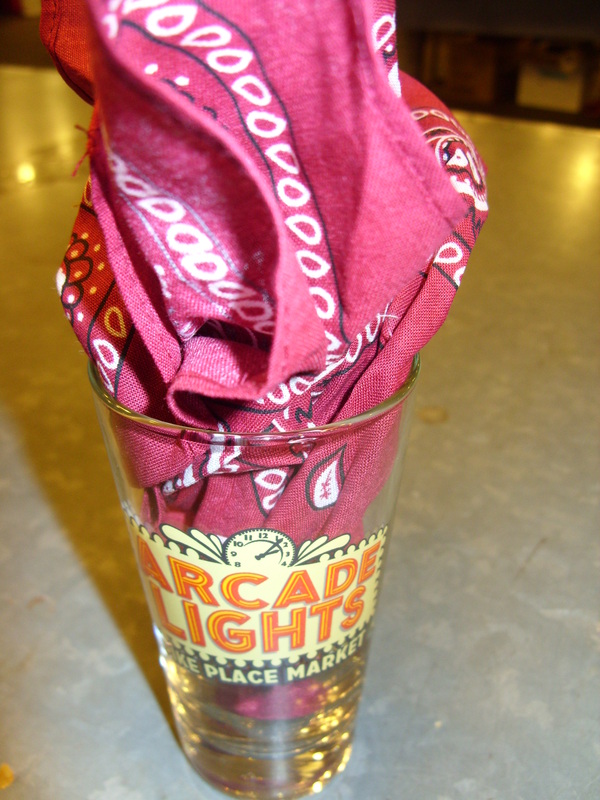 Always on the hunt for great food for my parties and events, I recently attended the Arcade Lights event at the Pike Place Market. This event happens a few times a year and I highly recommend you grab a friend or two next time it comes around and head on down! For $25 (or $30 at the door) you get 10 tokens. Each food and drink vendor charged 1 or 2 tokens for a small taste. 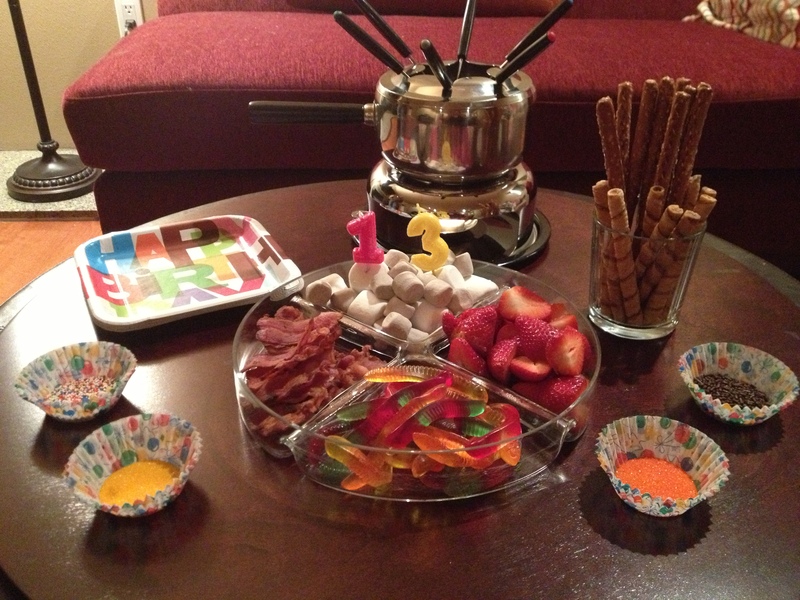 I found that I was perfectly satisfied with the ten tokens and was able to try a nice variety of things. 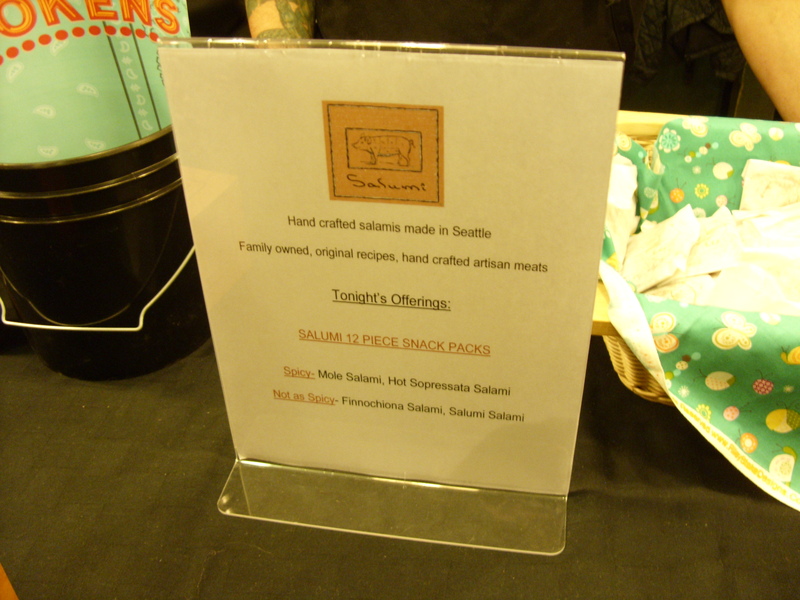 But they do sell tokens onsite so if you run out and still have places to try (and there are so many wonderful vendors! ), you are able to purchase more. 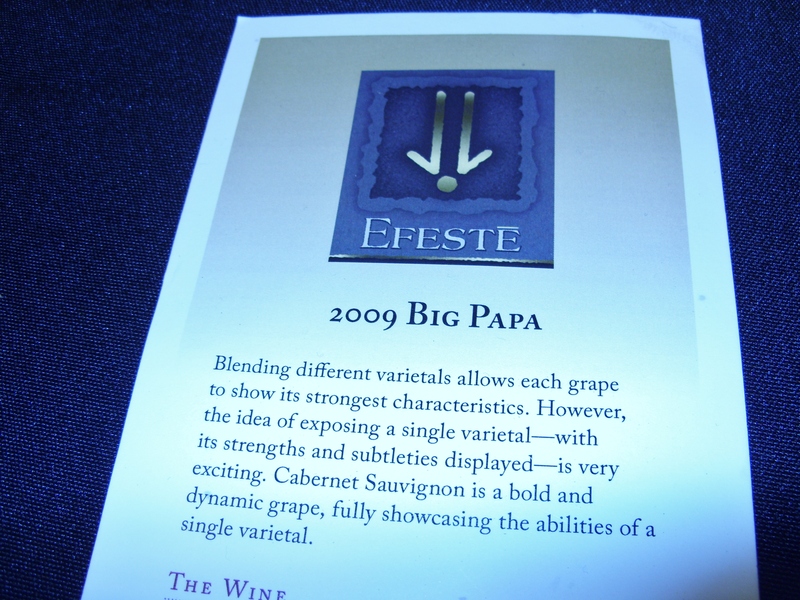 I don’t know much about wine – but this red from Efeste was smooth and delicious! 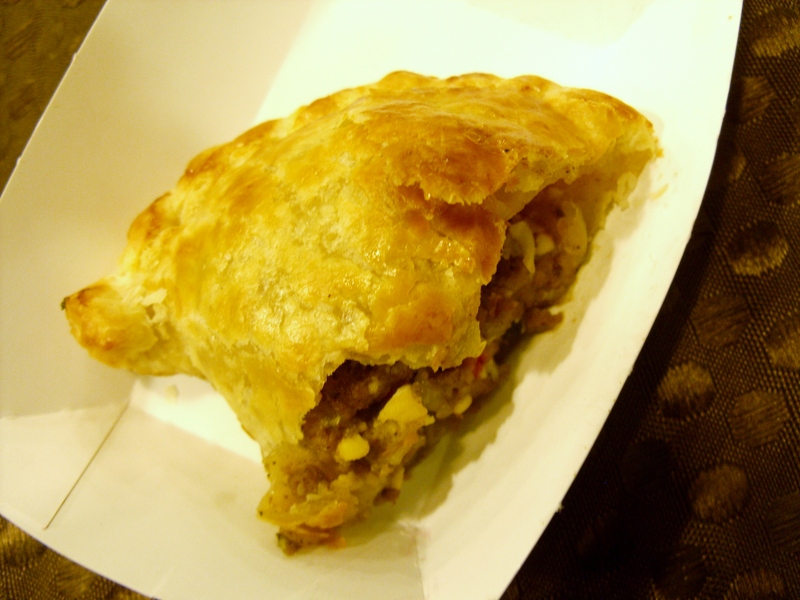 Pampeana Empanadas: I have been seeing this family-owned vendor’s delicious tweets for a couple of years now and have been dying to try their hand-made empanadas – oh my goodness! Why did I wait so long! SO GOOD! 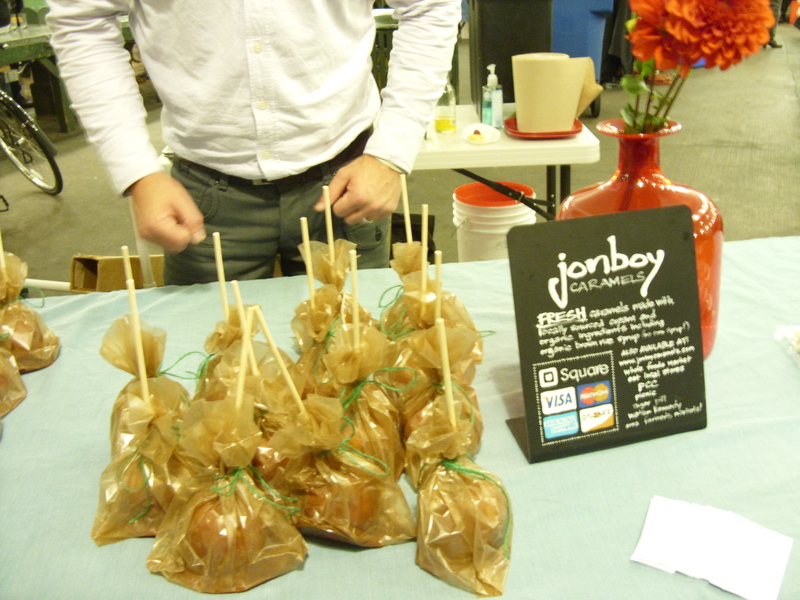 You can find them at local farmers markets, but they will also deliver (perfect for your next gathering!) a minimum order to your door – frozen and ready to bake. Mt. 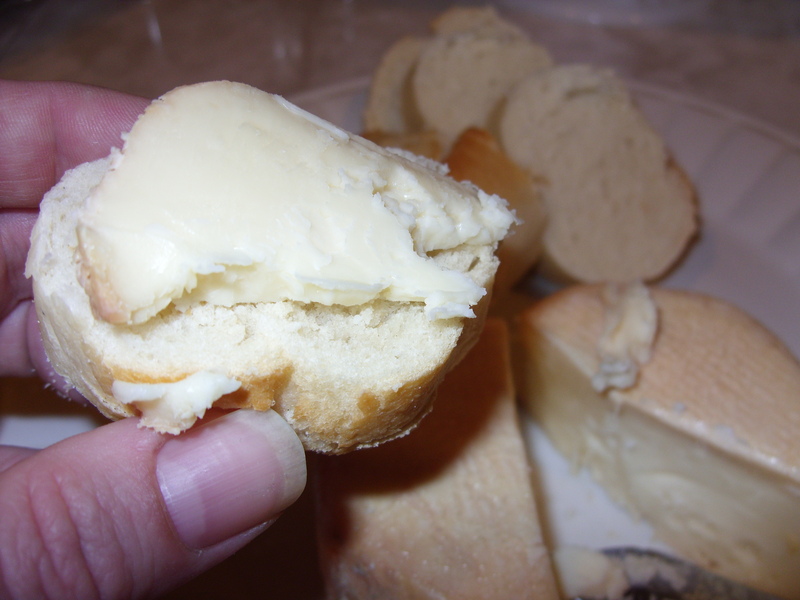 Townsend Creamery: I interviewed Julia from Mt. Townsend in my preview post for this event and I could not wait to try the menu item she had teased me with a couple of weeks earlier. I was not disappointed! Seastack paired with local pickled figs and black pepper crackers, and on the same plate, dessert featured Fromage Blanc served on a nigella shortbread with a lace of local honey and a zest of lemon. Outstanding! 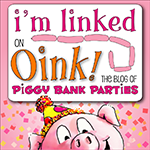 I do think this pairing will be making an appearance at one of my parties real soon! Next time you’re in the market, be sure and visit their tasting room near the fish throwing guys! 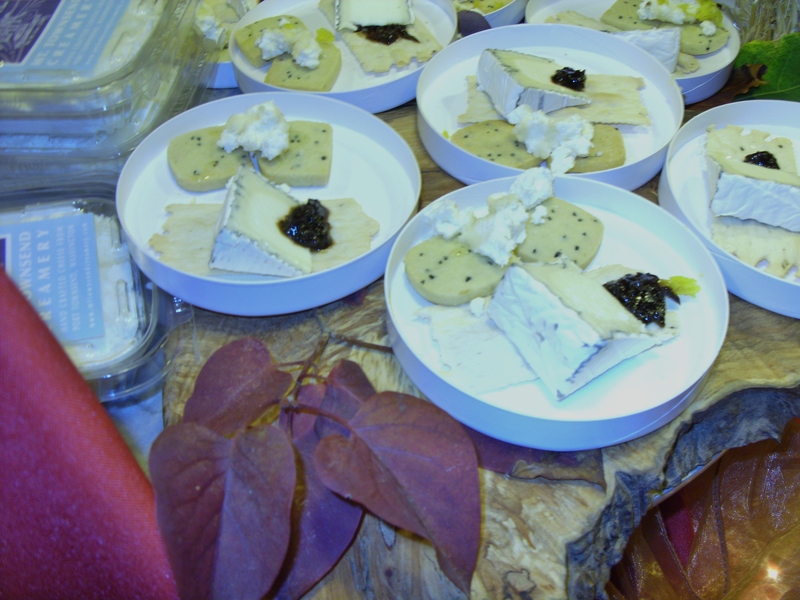 I promise you won’t find a more friendly cheese purveyor – and the cheese, oh the cheese! 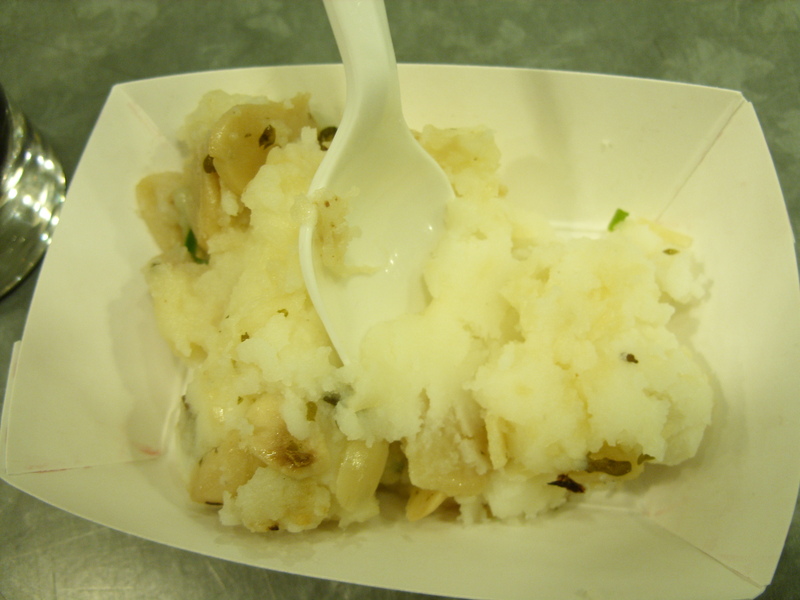 These vendors served up a very flavorful cheese and garlic smashed potatoes. You can find their jars of varying types of garlic at many locations throughout Washington and at Pear in the Market and fun garlic recipes on their website. I do love my garlic! I don’t usually seek out biscuits because I tend to find them quite dry. But I had been hearing so much about this place lately and I just had to try. 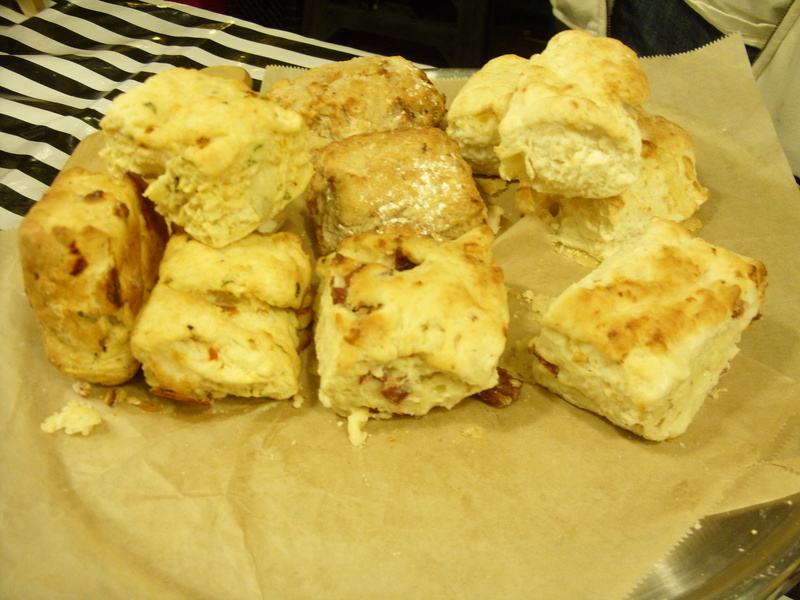 This Beecher’s Cheese and Hempler’s Ham biscuit was anything but dry – moist and buttery, I enjoyed every last crumb! Salumi: Salami is one of my favorite food groups! And the hand-made salami from Salumi in Seattle is some of the finest around. 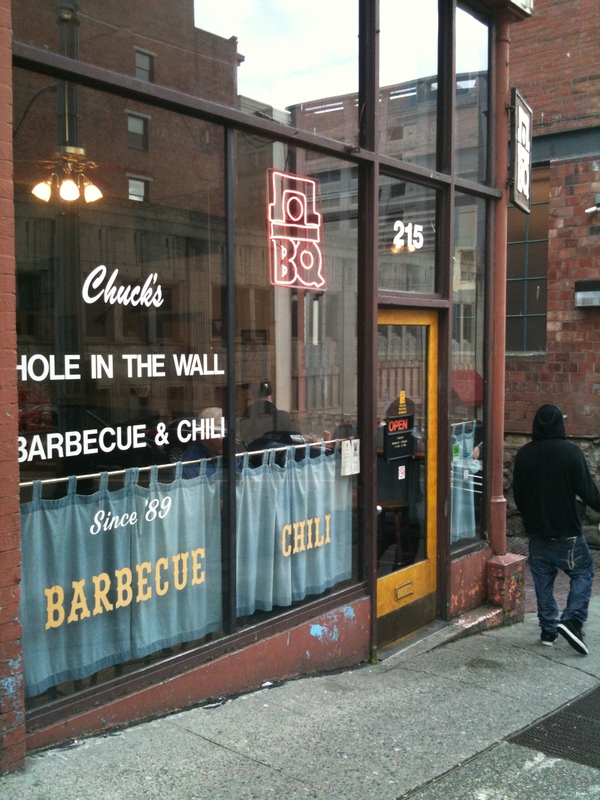 Their little shop in Pioneer Square has lines out the door at lunchtime with local commuters clamoring for one of their famous sandwiches. But the pure, unadulterated salami (and the other fine cured meats they sell at their storefront) would be just perfect on a charcuterie platter at an upcoming party. I had the spicy in case you’re wondering! These ladies were very hard to pass by! 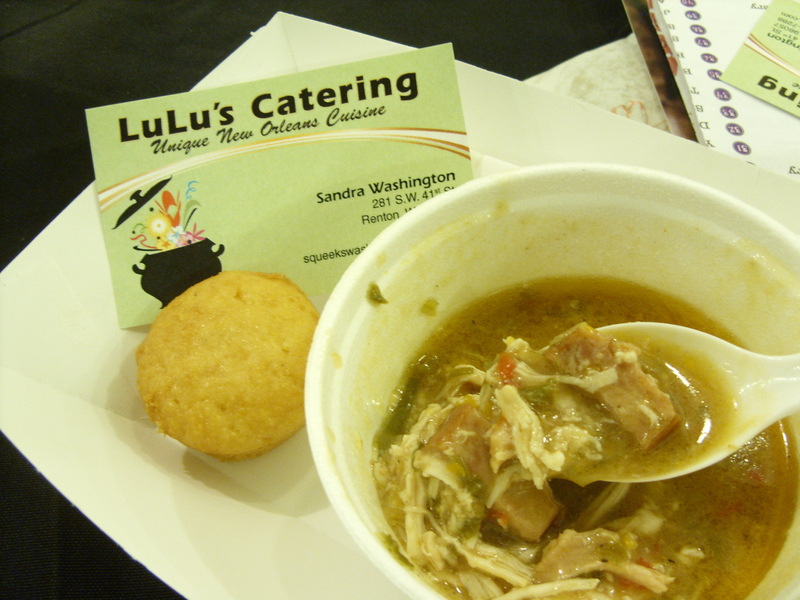 Their delicious Chicken and Sausage Gumbo and mini corn muffins was only outdone by their infectious, positive, fun-loving energy! 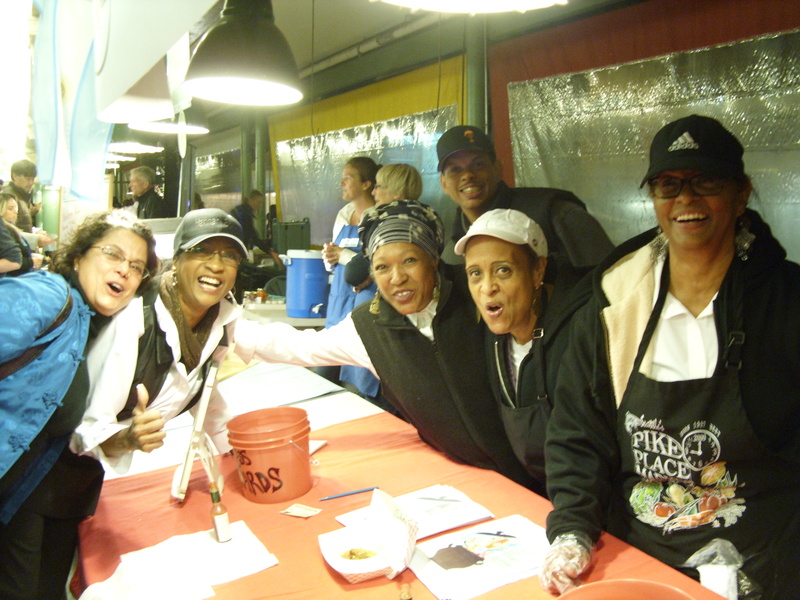 They just made me smile – and, as if their wonderfully executed authentic New Orleans fare isn’t enough, I would have them cater an event just to have these adorable ladies bring smiles to my guests faces as well! Bikelava: Okay – I have a confession to make. I did not try the baklava from these peddling vendors, but I just had to share because I know there are some serious baklava lovers out there and their presentation is too much fun! You can find this adorable, bike loving, married couple serving the tasty treats out of a wagon attached to the back of their unique (and yet, very Seattle!) ride. 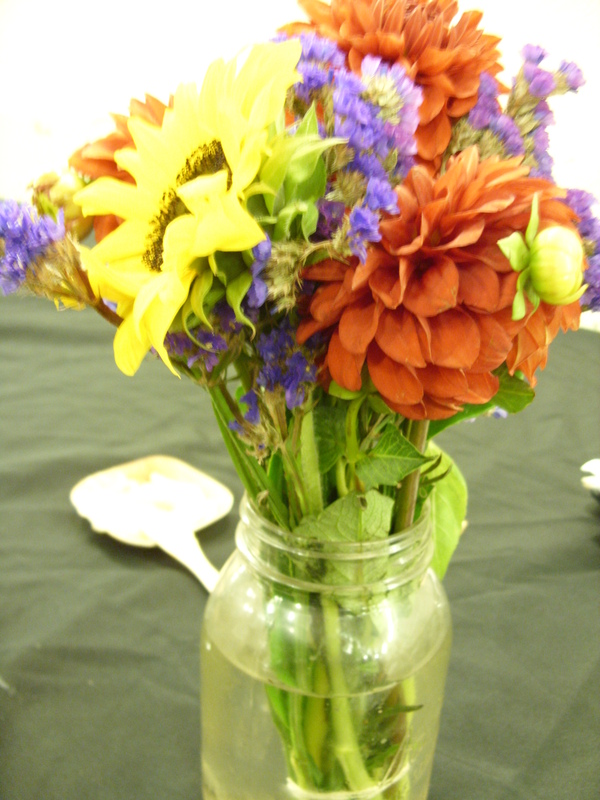 They attend local farmers markets and are available for event dessert catering. 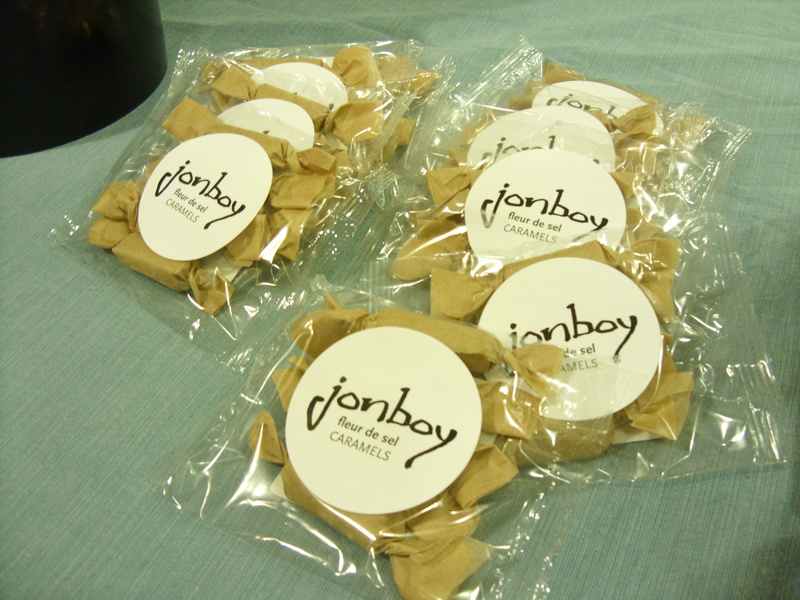 Jonboy Caramels: I tend to be more of a savory lover, but one of my favorite sweets by far is caramels! And I have just found a new perfect snack! These babies are pure gold in a brown wrapper. The fleur de sel satisfies my craving for savory while hitting that little part of me that desires a touch of sweet. Sold online or at local farmers markets, specialty stores, PCCs and Whole Foods Markets. 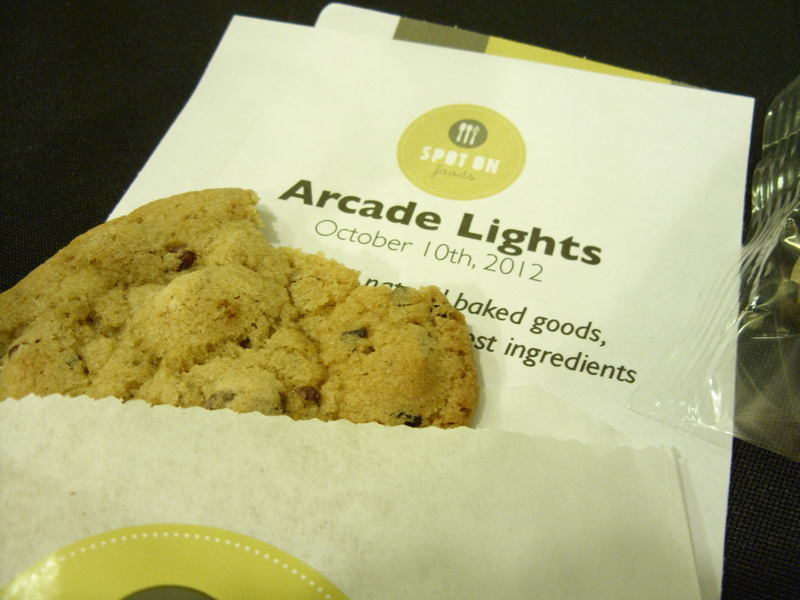 I rounded out the evening with a simple chocolate chip cookie from Spot On Foods. 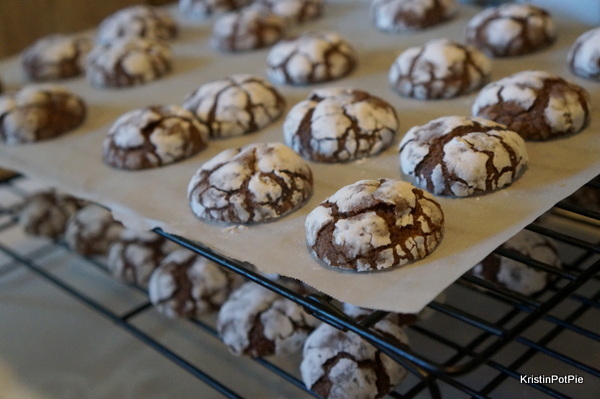 But of course, it was not really so simple – this baked from scratch, all natural, preservative free cookie had me at cocoa nibs – Theo cocoa nibs! Another obsession of mine! 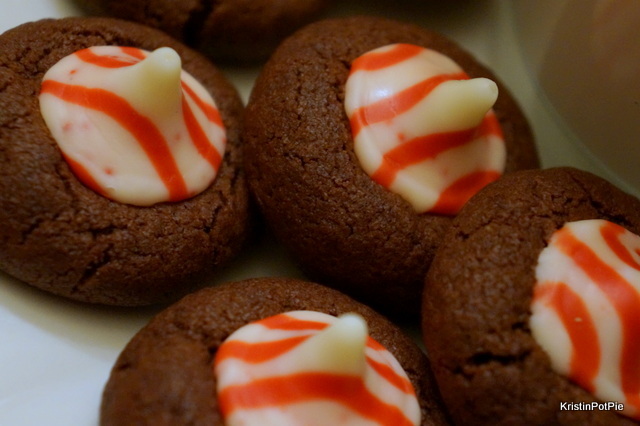 Spot On’s baked goods are available in local retailers and they do catering. Yes! 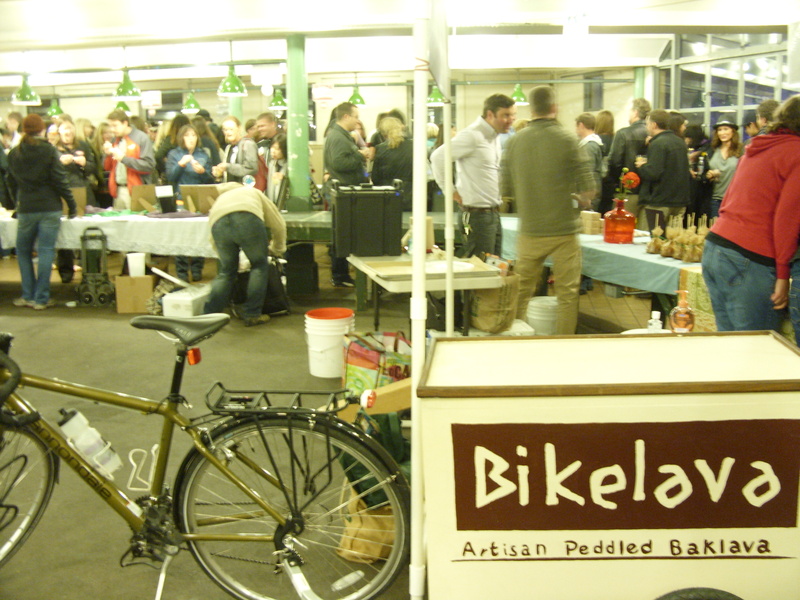 What a wealth of local food artisans we have available to us here in the Northwest. 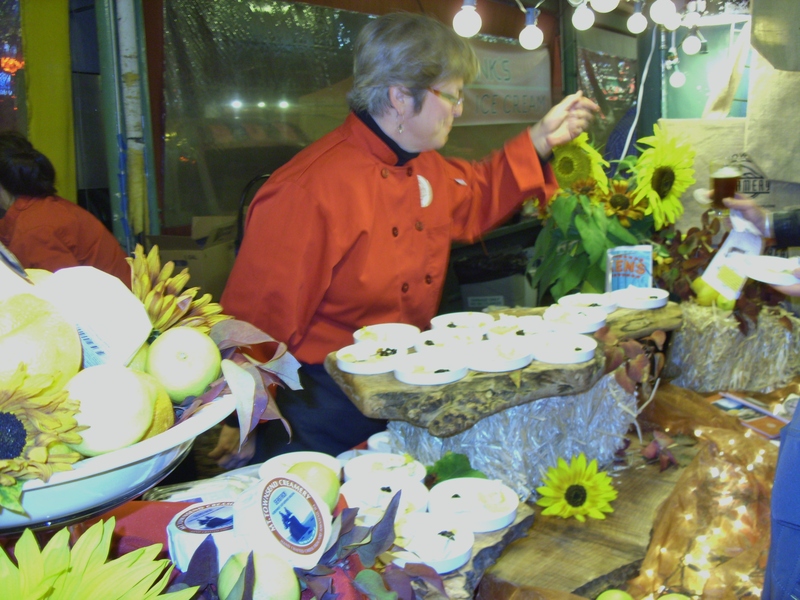 Next time you are planning a gathering, be sure to check out some of these vendors for something different that will really wow your guests! 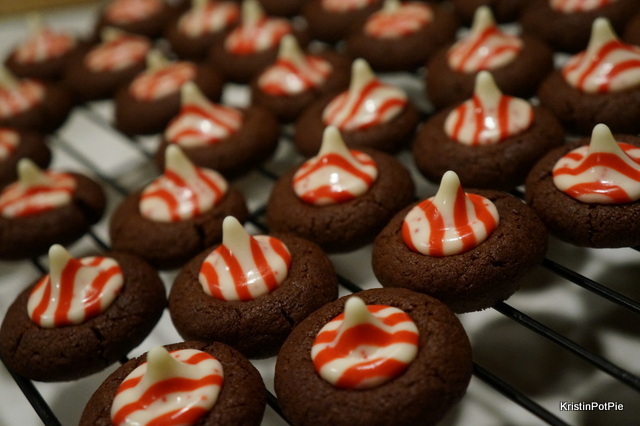 Earlier this week I received a message that was sent to local bloggers of Will Bake for Food, a food blogger bake sale I have participated in the last couple of years. They were requesting desserts made from the heart for attendees to bid on at the 35th annual auction benefiting the Emergency Feeding Program of Seattle. So I was proud to send this sweet Valentine to their very special guests who are helping to put food on the tables of our local hungry families. 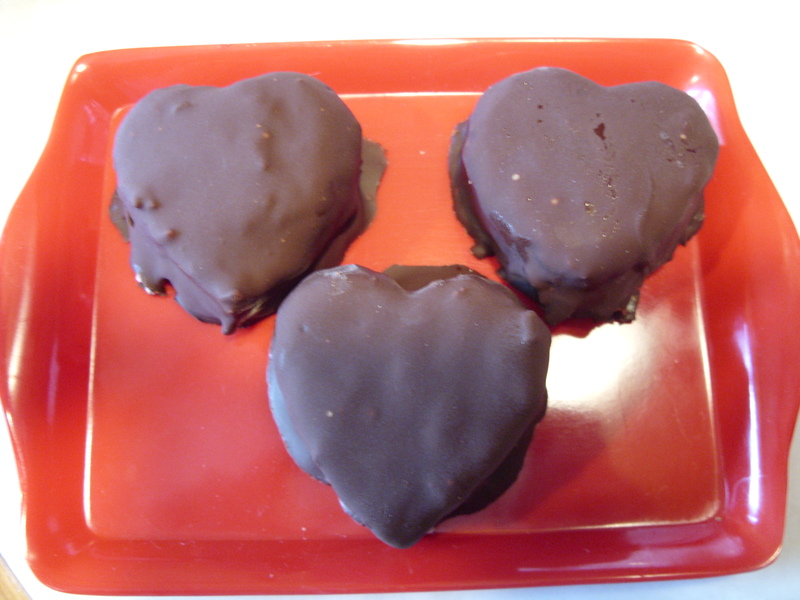 I usually make these at Christmas, but I think they make a fantastic Valentine’s gift. 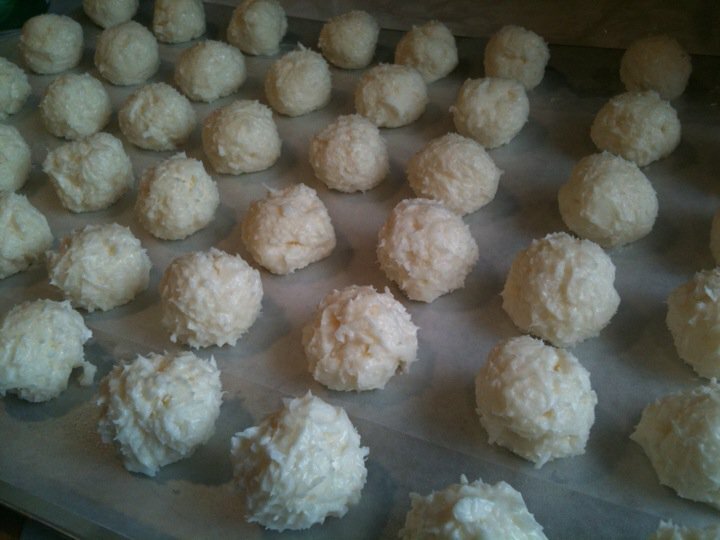 Coconut and dark chocolate are my favorite confection combination (right behind caramel and dark chocolate – especially if it has Sea salt on it! Oh my!) so these are definitely made from the heart. 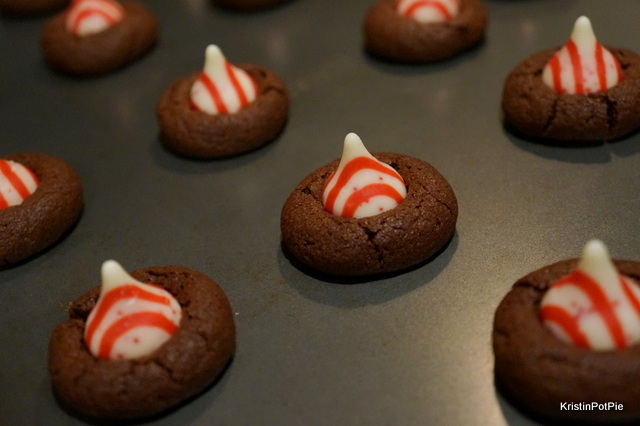 Do you have a special someone you can share these with? 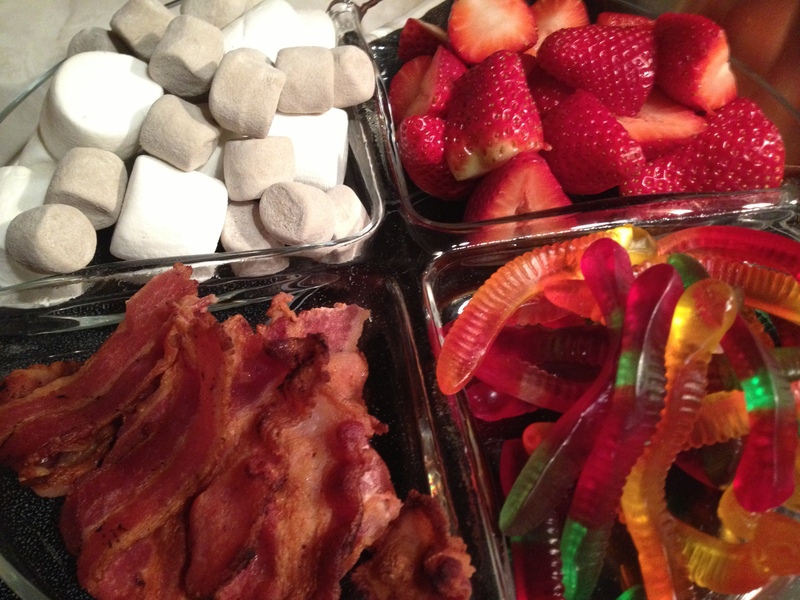 Place all ingredients except the chocolate in a large bowl and mix by hand. Put bowl in refrigerator to chill for a couple of hours. 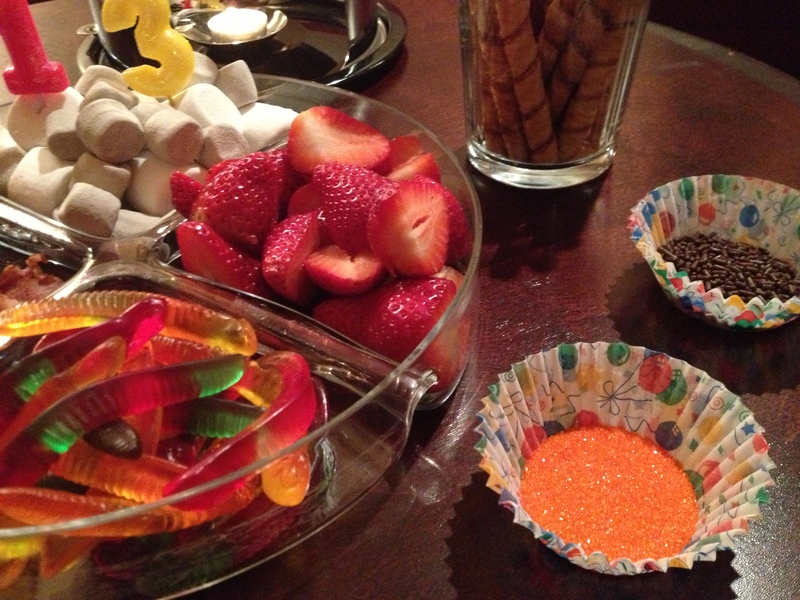 This makes it easier to mold the candies. 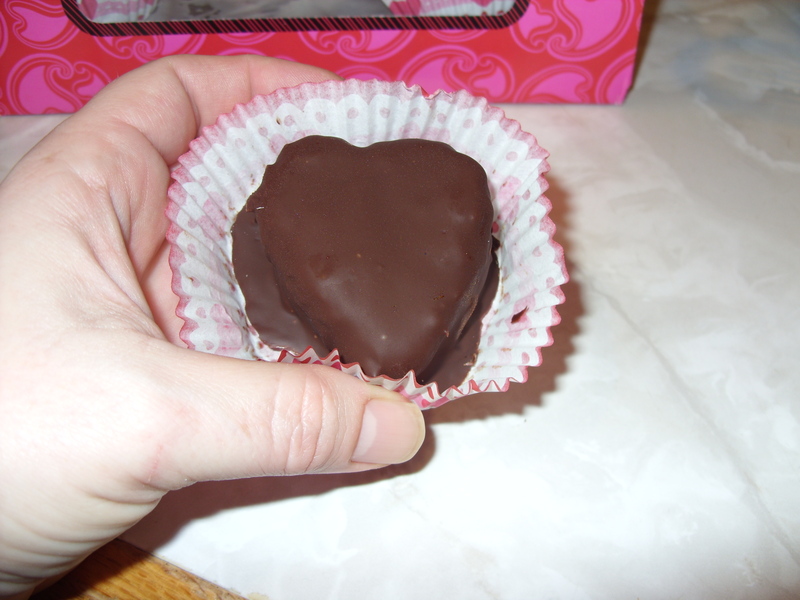 Mold about two tablespoon at a time with your hands into mound shaped (I made these my heart-shaped ones for Valentine’s Day with a small heart cookie cutter.) 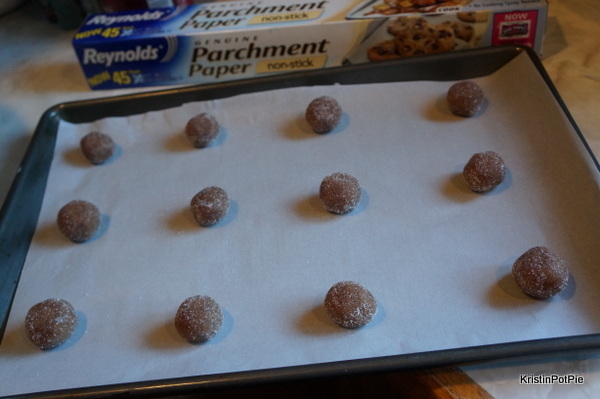 Lay on parchment paper covered trays and then place coconut shapes back in the freezer or the fridge to chill and set up for about another hour or two. 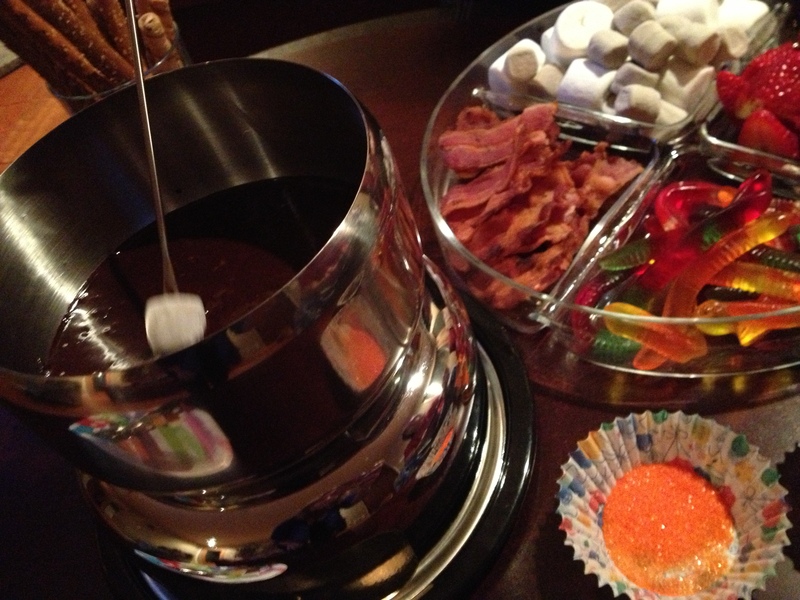 Melt chocolate on a double boiler. 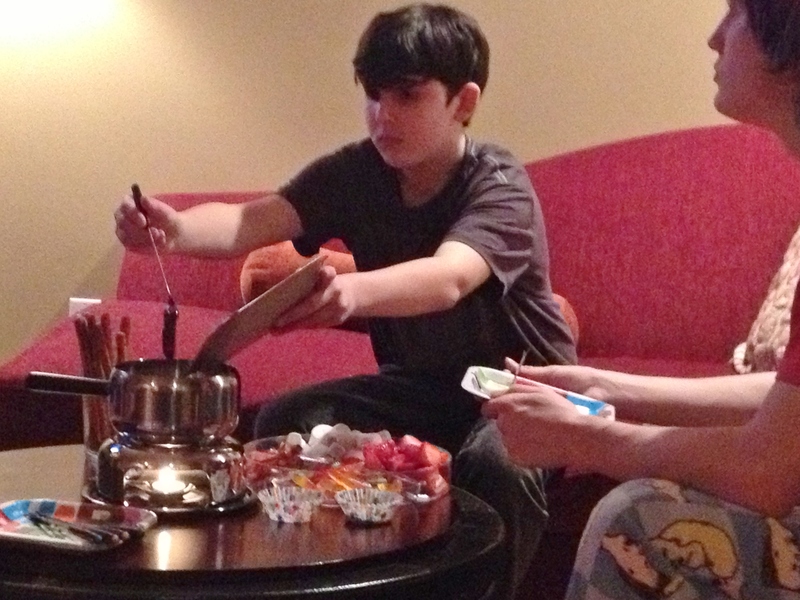 Dip each candy separately in the melted chocolate – being sure to completely cover it. 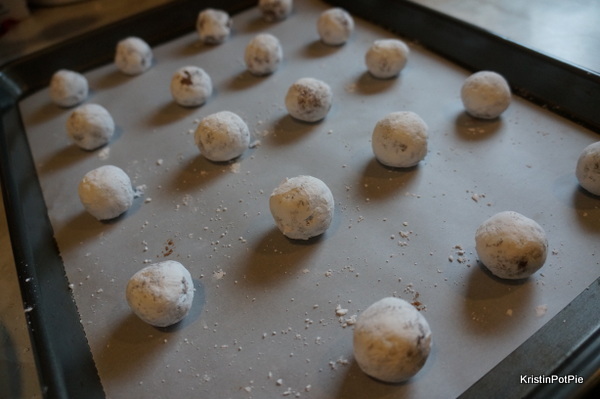 Place each chocolate covered mound on a baking sheet covered with parchment paper and place back in fridge (or freezer) to set up once again. 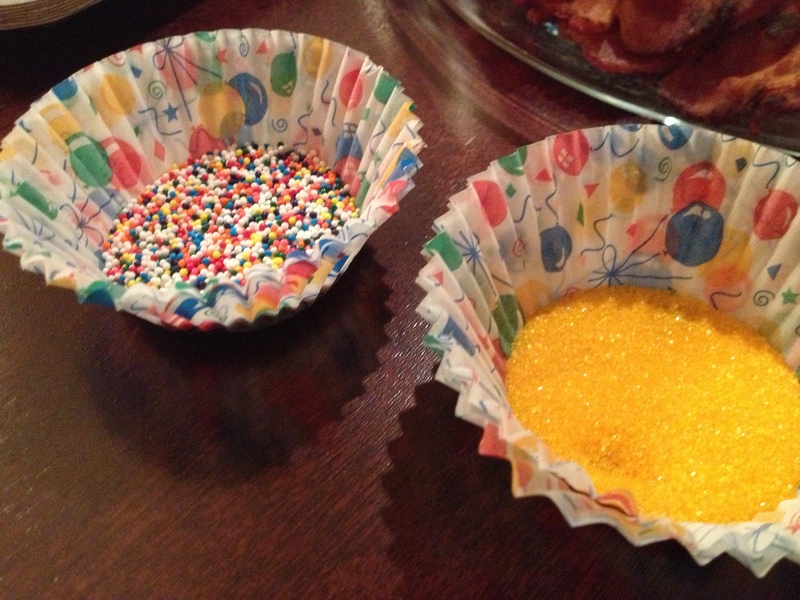 Then carefully remove the confections from the sheets, trimming the edges, and place each treat in a cupcake holder, separating layers with wax paper. Store in fridge and serve cold. 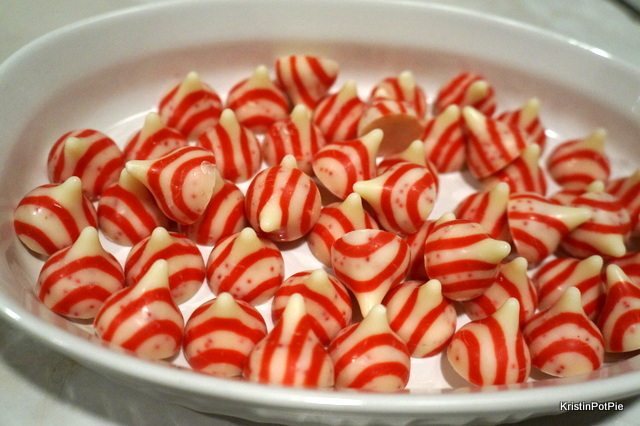 What sweets will you share with your sweets this Valentine’s Day?